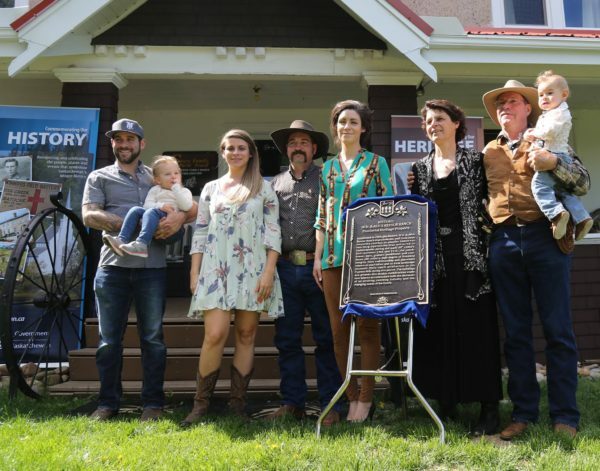 Friends, relatives and neighbours of the Reesor Family gathered Friday morning in the beautiful Cypress Hills to unveil a plaque commemorating the special designation of the Historic W.D. and Alice Reesor Ranch. Parks, Culture and Sport Minister Gene Makowsky and Member of Legislative Assembly Doug Steele were both on hand for the unveiling. “Today we have government authorities here, and they’re not here to arrest me,” joked Scott Reesor (a 4th generation Reesor) who along with his wife Theresa, three children and their families are the current owners and operators of the Historic Reesor Ranch. Historic places play an essential role in our provincial identity, our sense of place, and providing locations and events that support tourism. The ranch retains many historic buildings, which were constructed between 1906 and 1916, including the ranch-house, barn, granary, bunkhouse and roothouse. Tourists to the area can visit these buildings which continue to serve in the family’s ranching operations. The property is also operated as a bed and breakfast. The Historic W.D. & Alice Reesor Ranch is the first and only provincial property to be formally designated in the Maple Creek and Cypress Hills destination area. It is also the first historic ranch property in the entire province of Saskatchewan to be selected as a provincial heritage property. Manager of Community & Economic Development for the Town of Maple Creek, Royce Pettyjohn, served as Master of Ceremonies during the event and explained the historical significance for not only the Reesor family themselves but everyone in the area. “How appropriate that the first representative example of the historical significance of the ranching industry to our province was designated here in the beautiful Cypress Hills and within the R.M. of Maple Creek, an area steeped in deep and rich ranching heritage. The R.M. of Maple Creek of course, encompasses the town of Maple Creek which is where the very first shipment of cattle were loaded on the rails to market in 1884, earning the town its traditional moniker of “The Old Cowtown” and more recently the town was designated by the Western Horse Review as “Canada’s Greatest Western Town”. Scott Reesor recited one of his mother’s poems that she wrote to honour his grandparents, who had lots of memories on the ranch. “One of the good things about reciting poetry is that when the writer of the poetry puts some words together to make sense of an event or a situation when you recite those words they again make sense, and you don’t have to figure out a bunch of new words,” Reesor said. The poem encapsulated many things about ranch life in remote areas that could be anywhere in Saskatchewan or the world for that matter. “As I recite this, let’s remember that we all have a story to tell and a history that is valuable and should be recorded for succeeding generations to profit from,” Reesor said. Where they lived for many years. It knew their dreams, their hopes, their fears. ‘Oft in the dawn’s grey light. Through each day ’til it was night. Through the good years and the bad. Stuck it out and were glad. Came new life and springtime joys. And through the years the boys. Memories that go way back in years of which great tales can be told. Of blizzards sweeping o’er the hills, of cattle dying in the cold. And drove them on to shelter in brush or coulee or lie dead in the frozen dawn. To care for the poor dumb critters. It was sure no life for quitters. In these old Cypress Hills. Though he endures heat, pain or chills. Trailing cattle for miles in the cold. When taken to market and sold. It was all part of ranch work then. Separated the boys from the men. Some that call forth a real belly laugh. Like the sight of a newborn calf. As you worked in the sun or the rain. Forgot all the winter’s pain. And women’s work was never done. Or the death of an infant son. In the old black cookstove’s heat. So weary, most asleep on your feet. And those years that it didn’t rain. Burned like the hay and the grain. And you always ate three-square. Trips to town with buggy and team. For years was just a dream. Good times that were fun for all. And of dances, you can recall. Of boys joining the army to fight. Though somehow it didn’t seem right. And worked just as hard as before. At the ending of the war. I’ve heard that as you grow older, good memories blot out the bad. Turn back the pages of your lives, forget the sorrow and pain. Come back to the ranch on the hillside, and do it all over again? “Events like these help us appreciate the unique stories and places that make up the history of our province. To say it’s beautiful – I think you’re just starting to get warm,” Makowsky said. Pettyjohn concluded, “This plaque will be an endearing link to the past and a symbol of pride for all Canadians”.